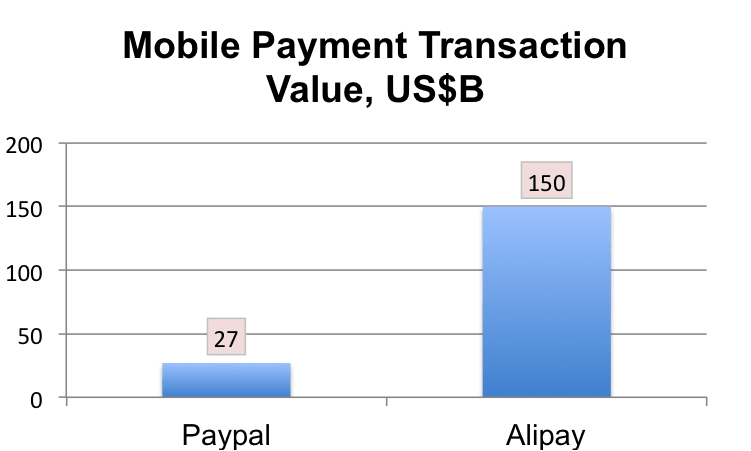 Over the past weekend, Alipay announced that it processed about US$150 billion in mobile payments in 2013 which is potentially more than PayPal and Square combined. PayPal cleared US$27 billion in 2013 and Square's number is not public, but likely far less than even PayPal's. The Alipay Wallet 7.6, which was rolled out on October 29, 2013, provides over 30 functions and services. It is reported that the launch of this new Alipay Wallet has extended its services in new areas and provides some significant benefits to consumers. Among these services, the most innovative are “payment with soundwave technology”, “transferred payment with emotional feelings”, “payment by snapping payment cards”, “Official Accounts” and “loading money into on-purpose campus card”. The application of soundwave technology in Alipay Wallet with smartphones allows consumers to make payments conveniently even when there is no 3G or Wi-Fi signal, such as at subway vending machines. By holding the phone close to the payment receiver on the vending machine, the phone can authenticate and authorize payment via sound. Alipay has already setup relationships with eleven vending machine operators that cover about 90% of the Chinese market. At the end of 2013, this soundwave technology will be used in over 50% subway vending machines. In addition, soundwave technology can also be used to purchase movie tickets. After paying for movie tickets from Alipay wallet, consumers can get tickets by releasing noise generated by smartphones which will be recognized by ticket machines in the cinema. To provide a more ‘humanized experience’, the Alipay Wallet 7.6 allows users to use personalized icons and voice messages when transferring payments. Unlike a payment that might come across saying ‘You have received 100RMB’, users can now choose from abundant personalized icons or leave voice messages with the receiver when conducing payment transmission. This may not seem that interesting, but in China, a lot of business is conducted over instant messenger and phone chat where emoticons and electronic signals of feeling are important, it does add an interesting element. However, it should be noted that the new function only supports payments within Alipay. The new Alipay Wallet has an enhanced “code scanning” function. In addition to existing scanning QR codes, bar code, tracking numbers, it offers service of scanning bank payment cards. This new function can distinguish information automatically including issuing banks, types of banks, card numbers, which make it convenient for users to transfer money. In addition, it adds function to pay off credit card bills automatically. Currently users can use Alipay Wallet to inquire credit card bills of 14 different banks. In addition, as long as the automatic payments function is active, Alipay Wallet will pay off credit card bills automatically 5 days before the deadline and will inform users by free text message. Official Accounts connects consumers directly with merchant accounts through the app for services. Basically the “Official Accounts” includes around 10 banks, such as Industrial Commercial Bank of China (ICBC), China Merchant Banks (CMC), Agriculture Bank of China (ABC) and etc; three most famous telecom operators of China Unicom, China Mobile and China Telecom; and other merchants such as, McCafe, One Foundation, hospitals etc. Within banking accounts, Alipay Wallet offer users’ inquires into balance, inquiries on account transaction details and inquiries on bank outlets. From telecom operators’ accounts, customers can inquire their bills and alternate mobile phone packages. Moreover, Alipay Wallet’s cooperation with McCafe, hospitals and other merchants, make it convenient for customers to recoup the coupons, pre-register, register in hospitals, as well as enjoy other services. Another new feature of Alipay Wallet is for university students. Instead of finding a recharge machine, students can load money into their 'on-purpose' campus card directly by Alipay Wallet. There are currently around 20 universities in Beijing, Shanghai, Guangzhou and Suzhou, cooperate with Alipay for this service. The new Alipay wallet 7.6 is an interesting development. Many of the functions make a lot of sense to just about anyone around the world - like the soundwave technology. The others, like the 'emotional payments', might seem a bit different, but are very tailored to meet the needs of the local users which has been one of Alibaba's keys to success across all of its platforms and it's where foreign players have often struggled in the past. The most recent Bankcard Consumer Confidence Index (BCCI) in China numbers show a continuing increase in consumer confidence since March 2013. According to the data released by China UnionPay (CUP) and Xinhua News Agency, the BCCI peaked at 86.69 in September; the BCCI has stayed high level for three months. It increased 0.89 compare to the same period in 2012 which is a positive sign that the macroeconomic environment is growing steadily in China, at least in the minds of consumers. By the end of 2012, there were more than 1.1 billion mobile phone users, and 360 million smartphone users in China representing both strong mobile phone penetration as well as a significant increase in smartphone penetration. With smartphones in the hands of more Chinese consumers, the mobile payment industry in China is nearing its watershed moment – as consumers increasingly use their mobile phones not only as communication devices, but payment tools. China is already the second largest economy in the world, however, RMB has really not been fully accepted as a payment currency internationally, which most view as a prerequisite to 'RMB internationalization'. On July 6th, People’s Bank of China (PBOC) issued 27 third party payment licenses to 27 companies bringing the total of 3rd party payment licenses up to 250. What catches our attention this time is the internet giants Baidu and Sina have both obtained licenses and will focus on online payment and mobile payment as their business scope and likely planning to leverage their huge existing user base. According to the specific targets for China’s EMV migration set by the PBOC, from January 1st 2015, all RMB settlement cards issued in economically advanced regions should be in the form of financial IC cards; most banks have sped up the issuance of financial IC cards since 2012. By the end of 2012, the total circulation of IC cards exceed 100 million, growing by 320%, and right now 98% of total POS terminals and 96% of ATMs in the market have already been upgrade to support the financial IC cards. It is expected that the total number of financial IC cards in China will hit 200 million in 2013 and continuously surge to 600 million by the end of 2015. Recently, Google managed to beat its rivals including Apple and Facebook to buy Waze, an Israeli mobile-navigation startup. Google will pay for more than $1 billion for this relatively unknown company. Similarly in China. One month ago, Alibaba, a global B2B giant, invested about $3 billion into Amap, China’s leading map and local based services provider which made Alibaba Amap’s biggest shareholder. Other China’s internet giants, Tencent and Baidu have also been focusing on their mobile map offerings. 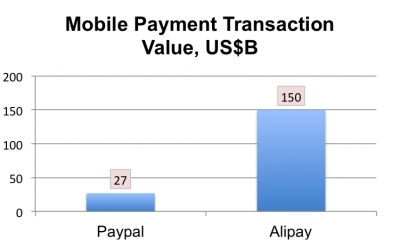 China Mobile's mobile payment transactions by value hits a new record. According to China Mobile, China’s largest mobile network operator, its monthly mobile payment transaction value, for the first time, exceeded 10 billion RMB, reaching 11 billion in May – even larger than the total transaction value of 2011. Since China Mobile launched its mobile payment business in 2009, the number of transaction has rocketed at a staggering rate and it is expected that by the end of 2013 the total transaction value will hit 100 billion RMB. In the future, China Mobile will emphasize more on product innovation and customer services to reinforce its leading position in China’s mobile payment industry. From the data released by People’s Bank of China for the first quarter 2013, the transaction volume of bankcards has reached to 100.27 trillion RMB, which is a 7.7% increase from the first quarter in 2012. The accumulated credit card issuance reached 343 million, which gives a credit card holding per capita is 0.26. According to PBOC, at the end of 2013 Q1, China’s bankcard consumption transaction volume and value rose rapidly by 44% and 60%, respectively. Interbank transactions made up the majority of total transaction volume and value – accounting for 56% and 77%, respectively. At the end of 2013 Q1, the total circulation of bankcard in China reached 3.6 billion, increasing by 19% year-on-year, with 3.3 billion debit cards and 343 million credit cards. The average bankcard consumption per person increased by 60% to 4900 RMB. 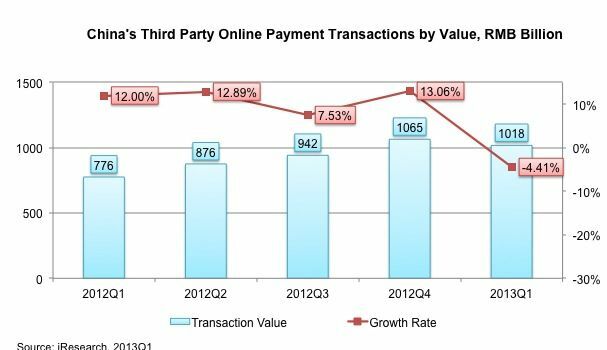 According to iResearch, the total transaction value of China’s 3rd party online payment in 2013 Q, for the first time, declined slightly from last quarter’s 1,065 billion to 1,018 billion, -4.4% quarter-on-quarter. After the staggering growth over the last ten years, China’s 3rd party online payment market has entered a more mature stage of development. This dip largely resulted from the increasing commoditized and homogenous products and services – 3rd party players need more innovative products to improve their services and boost their revenue in the future. Alipay is still the biggest 3rd party player, accounting for 48% market share, followed by China UnionPay with 20% market share. Recently, China UnionPay (CUP) and Xinhua News Agency jointly released the Xinhua • CUP Bankcard Consumer Confidence Index (BCCI) for March 2013. 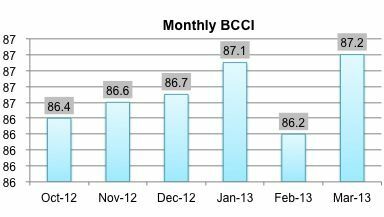 It shows that the BCCI is currently at 87.20, growing by 1% month-to-month and 0.43% year-on-year. Generally, the more consumption expenditure on non-necessities, the better macroeconomic situation and personal income reflected, and the more optimism consumers hold towards the future economic situation and personal income. Based on the transaction information of bankcard consumption by urban residents, this BCCI reflects the confidence level of the consumers towards macro-economy by analyzing the changes to the structure of the bankcard consumption expenditure (mainly the change in the proportion of non-necessities to total consumption amount). Chinese government’s further push on domestic consumption will continue to drive the steady growth of BCCI. According to Beijing’s government, the total transaction value of e-commerce in Beijing, one of biggest cities in China, grew by 45% to 550 billion RMB in 2012. Beijing’s e-commerce market is characterized by its high transaction volume, which has prompted half of China's top 10 e-commerce companies set up headquarters in Beijing in often in one of the two national e-commerce industry zones which attract a great number of small and medium e-commerce firms. Beijing’s government expects that its e-commerce transaction value will grow at 22% CAGR and hit 1 trillion RMB in 2015, which will account for 60% of Beijing’s GDP.